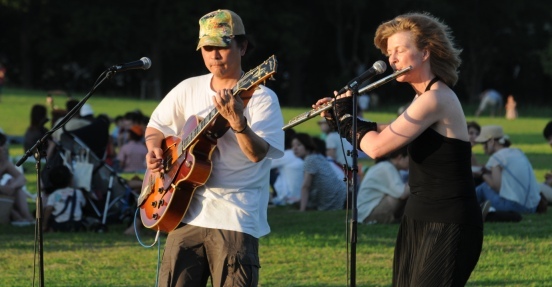 ﻿ Bix&Marki summer tour 2011："Bix&marki original french pop jazz live concert INFO"
We had 10concerts in West Japan from the 23rd July to the 7th Aug. Thank you very much for coming to our concert and also we thank the sound and light engineers and all the people who helped us organize this tour! It was our first concert in the tour and we were very happy to see this beautiful big space. Wooden hand-carved chairs, stools and tables, a colorful exhibition in the mezzanine. Friends and ex-students from Brussels came to see us. It was a very very nice place to play. 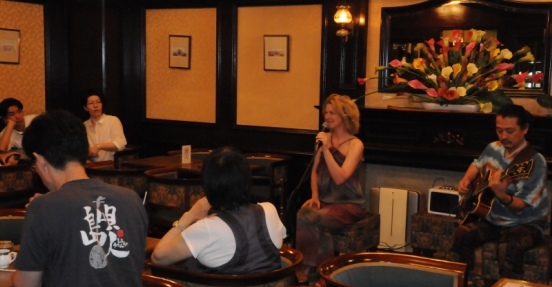 In this bar-cafe we had a lovely audience, seated on high seats, most of them could seemingly speak some French. Thank you to the Tokai Geijutsu Academy,and also to Tomoyo who took so good care of us during our stay in Nagoya. 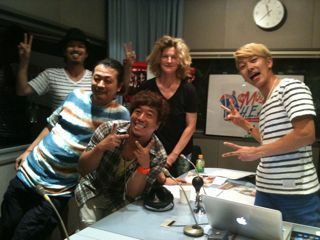 We were invited to speak about us and our music on Radio Kansai. The program was presented by the music group called Unlimited Tone, composed of 3 very friendly and good vocalists...We were invited to play one of our songs “Live” but also to sing with them, which we did: good harmonies came out in Summertime. We spoke about our background, the meaning of our music - and we got almost a whole hour. Lovely chance given by Misa in Kobe. 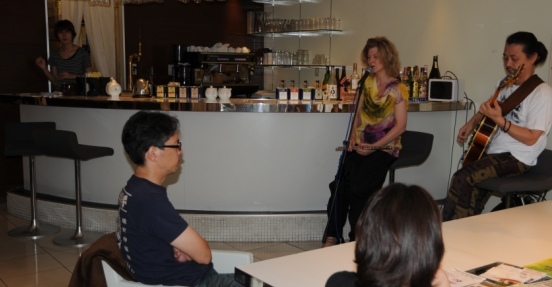 We got response from the audience, and for each of the next concerts in Kobe, people came who had listened to the radio program. 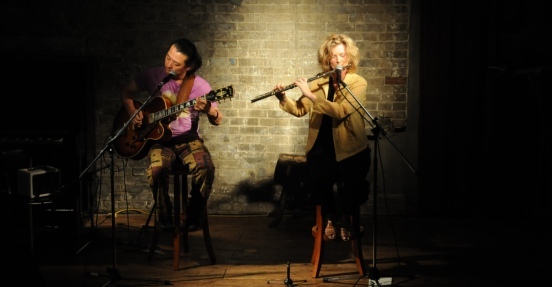 The Urban Guild concert was a very special one: friends from various periods of our lives came to see us and we felt very emotional playing there, remembering years back when we were living in Kyoto . But we also felt strong energy in the space itself, in the walls, on stage, where all kinds of interesting and experimental performances often take place.We played some tunes with Kyokazu Kuri and Christopher Fryman. Kuri san's crazy saxophone and Christopher's soft trumpet sounds gave a great contrast to our music. An old European style interior met us and our music: a warm and deep carpet, flowers, creamy desserts and cocktails. This concert got its own hot-chocolate style, thanks to Misa and Ya-chan. Many people came to hear us in this dreamy space. Organic food and good coffee... Rebeau was a fresh and relaxing place to be. Our music got yet another setting.We also wish to thank Misha for her participation/helping with it. 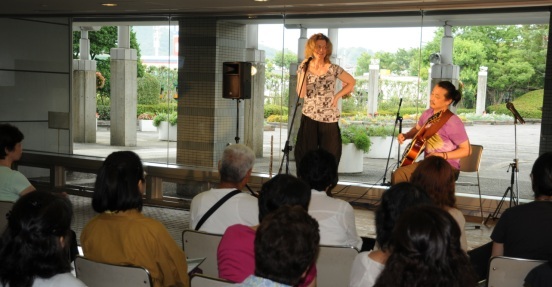 In the Kawachinagano City Hall, we played for an audience of more than 120 people. Very well organized, thanks to Lovely Hall, the City Hall and the producer Harmony Fields, we were able to present a part of French culture through our songs. Behind the stage,there was a nice garden and a nice view of the mountains. We appreciated the speech of the presentator who had a great humor and the fact that we shared this stage with accordionist Kanako Kato. 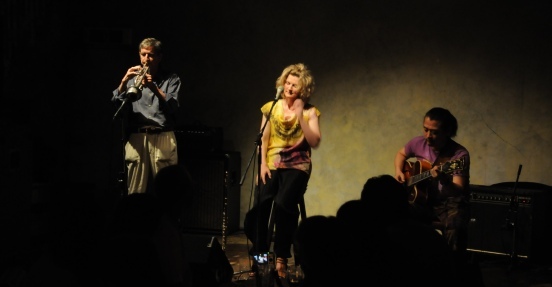 This was an opening concert to introduce the festival on the 18th of September. Between Osaka and Kita Kyushu there is this City Line Ferry. We played in the lounge for lots of people: families on holidays, truck drivers, basketball, hockey and volley-ballschool sports teams. 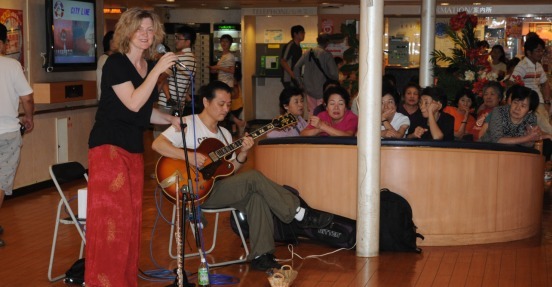 It was probably a very surprising concert for them to see on the boat, but we were happy that some of them seemed to like our music. This place in an old brick hall was great. Sofas and deep armchairs for the audience, beautiful pictures on the walls, objets and decoration in the most subtile forms, A mezzanine and a big wooden stage. The sound engineering - work of the technician was perfect. It was a magic evening, with a magic audience who listened to us in silence . It was the first time for us in Moji but certainly not our last. Hiroshima-shi Nakaku, next to the Shintenchi park. A superb audience in a wonderful restaurant,and we got an enormously warm support. The food was very very good, especially the sashimi. 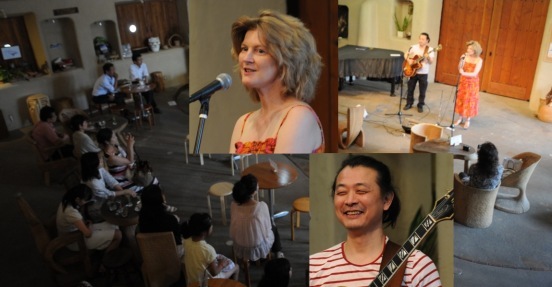 The friend of a friend's sister in Hiroshima, Ms Abe, kindly organized the concert and she brought her family. The owner Mr Nagahama invited some of his clients. Other people in the restaurant listened to us too. After the concert we talked with everyone. 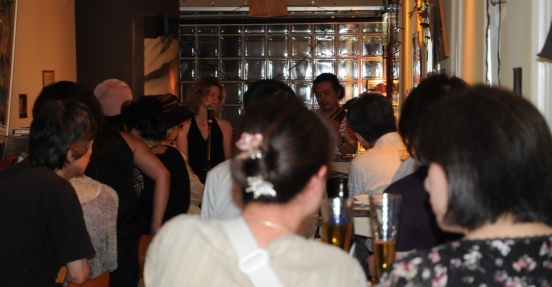 We enjoyed enormously this get-together of people, that happened by coincidence through our music. 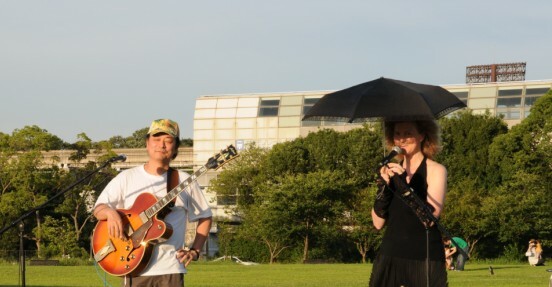 Thanks to Harmony Fields again, we played in the Lohas Festival, for thousands of people, outdoors on the grass. The atmosphere was fantastic, calm, open, free, natural: a modern Woodstock. We enjoyed playing there with all the elements around us, the wind, the sunshine...we loved to play for the people there and the idea of the festival. Some of our friends from Osaka and Kyoto came too. The Banpaku Koen at night and the Festival were lit up in the night, like a beautiful fairy tale.